Do you suffer from migraine or headache when you wake up in the morning? Does the headache subside during the day? Are your jaw muscles aching and tensed every morning? Has your partner or your keen heard your teeth crunching during your sleep? Are your teeth fractured? Do they have small or bigger cracks? unconsciously your teeth during the night, or more rarely during the day. Bruxism is a very common habit affecting 8% to 10% of the general US population. Teeth grinding at night is also common in childhood. However, it is not usually damaging or worrisome since most children outgrow it by adolescence. The most common causes of bruxism is stress or anxiety. You will notice that the symptoms occur more frequently and with greater intensity during stressful periods in your life. Bruxism is sometimes a side effect of antidepressant medication. People who suffer from sleep disorders such as snoring, sleep apnea, sleep talking, periodic leg movements at sleep are more likely to grind their teeth. A recent study presented at the American College of Chest Physicians (ACCP), found that nearly 1 in 4 patients with Obstructive Sleap Apnea (OSA) grind their teeth during the night. The findings are more prevalent in men and Caucasians. 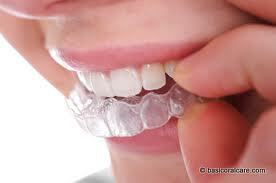 Bruxism can be treated in most cases with very good results, by constructing customized mouth guards. The splint is slim, soft, and transparent and is fitted in the teeth of the upper jaw. The patient wears the mouth guard during his or her sleep and soon the muscles relax and the symptoms subside. After concluding a prosthetic restoration, I always recommend to my patients with bruxism history, the use a mouth guard. This way they are able to protect their crowns veneers and implants from the large forces generated during teeth grinding. 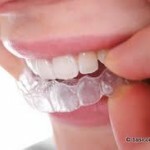 In our practice the mouth guard is made especially for you after initial examination and diagnosis. We can create them within two working days and they cost just €150. Are you not sure whether you are grinding your teeth at night? Ask your partner if he or she hears a strange squeaking noise at night. That might be the sound of your teeth. Or take a close look at the mirror: Are all your teeth the same length? Do they have flat edges even the canine? Alternatively you can have a dental check-up with me or any other dentist, who can answer your questions and provide treatment.